The Device Manager is a window listing all the hardware in your laptop, and it’s extremely useful for troubleshooting. In fact, a quick glance at the Device Manager window is all it takes to determine whether any hardware is behaving badly inside the computer. To display the Device Manager in Windows Vista, open the Device Manager icon in the Control Panel. A User Account Control warning may appear; click the Continue button. 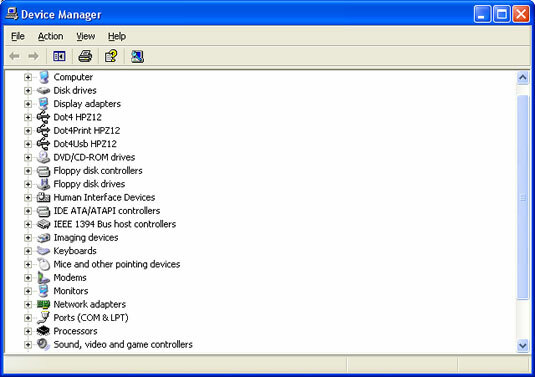 The Device Manager window then appears, as shown above. In Windows XP, show the Device Manager window by first opening the System Properties dialog box. Right-click the My Computer icon and choose Properties from the context menu to display the System Properties dialog box. Then click the Hardware tab and click the Device Manager button.